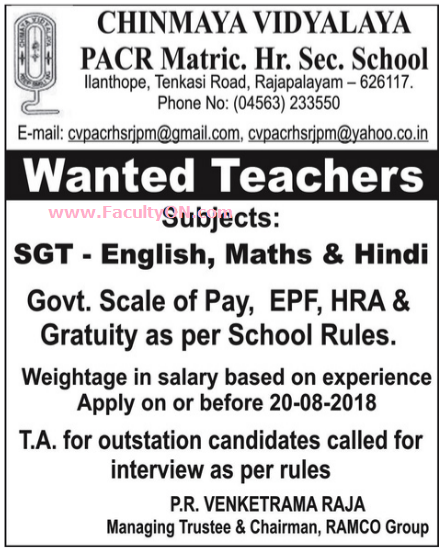 Chinmaya Vidyalaya PACR MHSS, Rajapalayam has advertised in the DINAMALAR newspaper for recruitment of Teachers SGT jobs vacancies. Interested and eligible job aspirants are requested to apply on or before 20th August 2018. Check out further more details below. About School: Chinmaya Vidyalaya Srimathi P.A.C.R. Sethuramammal Nursery & Primary School and Chinmaya Vidyalaya P.A.C. Ramasamy Raja Matriculation Higher Secondary School, Rajapalayam are the co-educational schools affiliated to the Matriculation Board, Government of Tamil Nadu and run by the PACR Educational Trust. How to Apply: Interested and eligible candidates are requested to send CV, copies of certificates and recent PP size photo to the postal address or email address provided here.